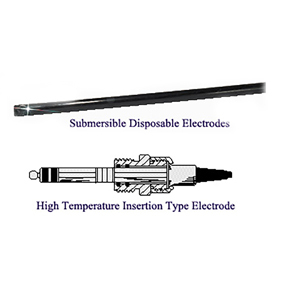 Submersible Disposable Electrodes are combination electrodes that are permanently potted into a 36" pipe. Ideally suited for measuring pH in drums, tanks and open streams, the electrode features an annular ceramic reference junction and is supplied with 3 m (10') cable with BNC connector. 참고: pH electrodes are designed to be mounted vertically. They should not be mounted less than 15° from horizontal, unless otherwise specified. Standard electrodes come complete with 3 m (10') of cable with BNC connector and electrode care instruction sheet. Sensors with ATC (automatic temperature compensation) come complete with 3 m 10' of cable with spade lugs and electrode care instruction sheet.